The board of the National Transport Authority will make a final decision on price rises in the near future. It's been recommended that taxi fares rise 3%. GETTING IN AT the last second before the Dáil was suspended for its summer recess, the Legal Metrology (Measuring Instruments) Bill passed through the house. It’s a short piece of legislation, but it aims to, as Minister Frances Fitzgerald put it, allow the public to know “that there are penalties for those who mess around with” measuring instruments such as taxi meters. Just a week before, the National Transport Authority announced that it had been recommended that taxi fares increase by 3%. This comes after a review which said that the costs of operating a taxi had increased by this amount since the last price rise in 2015. Some taxi drivers that TheJournal.ie spoke to, however, said the fare increases will act as a deterrent for people to get taxis and that the cost of recalibrating the taxi metre means that it’s not worth the hassle. So for your journey into town, or into work, that costs €18, will soon cost around €18.70. For the taxi driver though, the cost of this rise can be high. Once the fares go up, all taxi meters will need to be recalibrated to adjust to the new fare system. Getting that done can cost up to €100, some taxi drivers told us. Furthermore, the devices need to be checked by the National Standards Authority of Ireland’s Legal Metrology Service. This costs a further €86 to be done by the NSAI’s chosen “accredited verifier”. The penalties for not changing over can be costly. If a taxi meter is not calibrated correctly, the driver is liable to a fine of €250. And if the device is not “sealed” by an accredited verifier, then a fine of €80 applies. Bill McSweeney, from Irish Taxi Tours, told TheJournal.ie that while the cost of operating a taxi is indeed rising, a rise of 3% is “totally negated by the cost associated with having to recalibrate and reseal the metre”. “People wonder why taxi drivers are cynical,” he said. “We’re required to get the meters recalibrated every few years anyway. So we could go get it recalibrated as we’re required to do, and then have to spend the same money when the NTA raise the fares a few months later. That sentiment was echoed by taxi drivers we spoke to at ranks on O’Connell Street and Dame Street in Dublin. In a statement to TheJournal.ie, a spokesperson for mytaxi, formerly Hailo, said that while it welcomes increases, measures were required to encourage more people into the profession. The final decision to raise the prices rests with the board of the National Transport Authority. The earliest that the new fares will apply is the beginning of 2018. Email “Your taxi fare is set to go up again - but some taxi drivers aren't happy”. 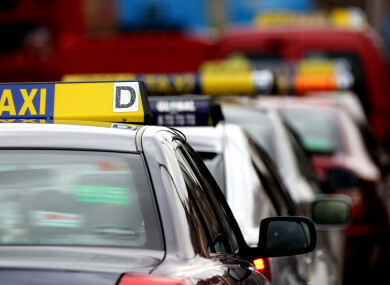 Feedback on “Your taxi fare is set to go up again - but some taxi drivers aren't happy”.